At Alexandria, Va., May 24th, 1861. Now, friends, I beg you listen, a sad story I will tell. After raising up the banner of his own dear native land. 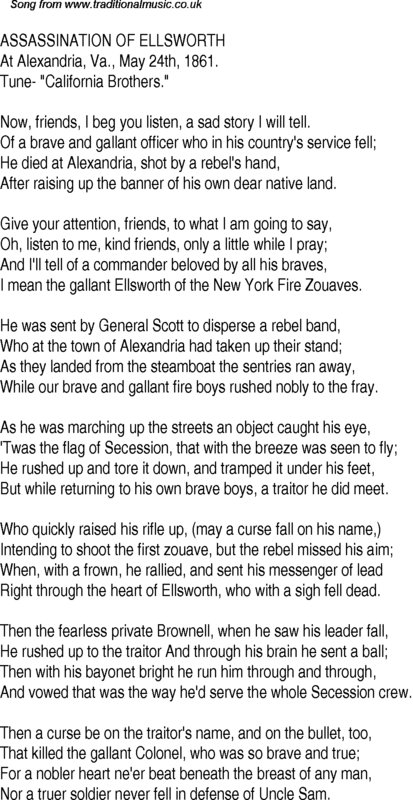 I mean the gallant Ellsworth of the New York Fire Zouaves. While our brave and gallant fire boys rushed nobly to the fray. But while returning to his own brave boys, a traitor he did meet. Right through the heart of Ellsworth, who with a sigh fell dead. And vowed that was the way he'd serve the whole Secession crew. Nor a truer soldier never fell in defense of Uncle Sam.